Essie is at that wonderful curious age of being inquisitive and wanting to explore. Open this cupboard and see what's inside. Shake that toy and see what sound it makes. Stack these blocks and see how tall they get. 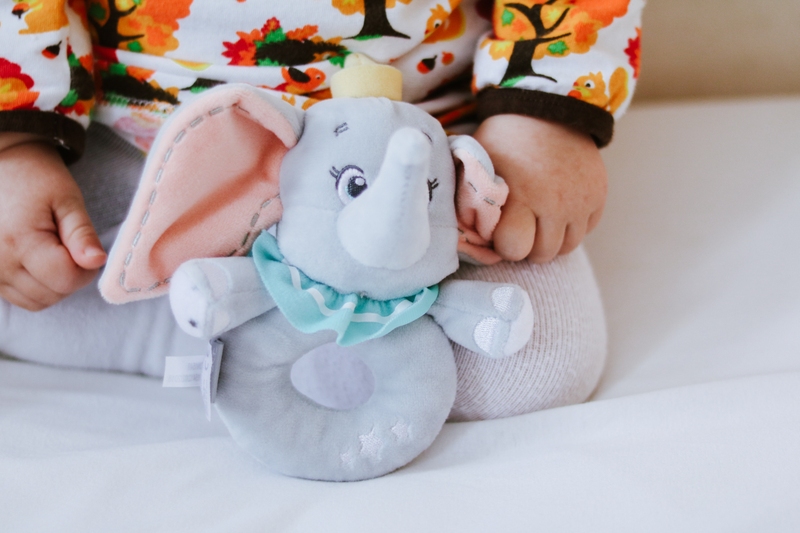 Anything new that comes into the house gets thoroughly investigated by her, like these two adorable Disney Baby toys we were sent by Rainbow Designs; the Patch Comfort Blanket and Dumbo Ring Rattle. The Disney Baby Dumbo Ring Rattle is instantly recognisable as the loveable character from the movie, with his little yellow hat and colourful collar. The ring is small enough for Essie's little hands to grip while she shakes to hear the tinkling noise. She also likes to hold it by the ears or by the trunk - poor Dumbo! It's so soft and has beautiful embroidered details like tiny stars on the ring and stitching around the ears. Patch is the most iconic of all the puppies in 101 Dalmations, which is one of the children's favourite movies after they received it as a gift from Nanna at Christmas. The Disney Baby Patch Comfort Blanket is a super soft comforter with four knotted "paws" at each corner. Children will recognise the character straight away, as it has the large patch over the puppy's eye just like in the movie and a little collar and tag. Instead of Dalmation spots, the comforter has tiny grey stars all over it and like the rattle it has beautiful embroidered details. It has "nap time" stitched across the bottom, but it's loved by Essie all the time, not just when she's snoozing! Both of these toys are suitable for all ages so they would be a wonderful gift to give a new baby especially as the soft, muted colours are sure to suit anyone's tastes. They are hand washable and air dry only, so that is something to bear in mind as they can't go in a machine wash or be tumble dried. The sizes are ideal for little hands and great for popping into my changing bag when we go out. Essie likes to have something to play with when she's in the pushchair or in the car and these are perfect. Both of these toys are available exclusively at Tesco along with the rest of the new Disney Baby range, so do look out for them in store and online! For a chance to win Disney Baby Patch Comfort Blanket & Dumbo Ring Rattle, simply complete one or more of the entry options below. Good luck! UK only, ends 29/04/2018. Full T&Cs here. With thanks to Rainbow Designs for sending the toys to review.